Fiddle is a colloquial term for a violin. The two instruments are usually identical. While fiddles are often used to play folk music, they too can be used to play classical pieces. Fiddles or violins consist of a sound box and a neck. The strings are stretched across a small bridge on the neck and pass in between a pair of roughly S-shaped slits in the sound box. The strings provide the fiddle's basic sound. The box increases the resonance of that sound. 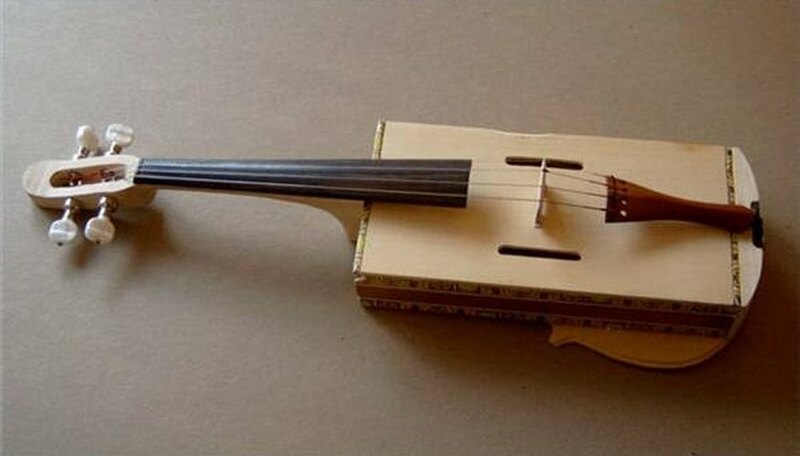 You can make your own simple fiddle out of a variety of materials, including a cigar box. Cut two S-shaped slits in the top of a cigar box. The slits should be to the left and right of the box's center, and cover at most about half its length. Shake out any debris from the box and glue down the lid. Glue a small wooden block onto the lath a few inches from one end. This is your bridge. Cut four slits into the top of the bridge. Glue the second block in between the two slits on the sound box repeating the same procedure for cutting four slits in the block. Make a horizontal row of four thumb tacks an inch or two above the neck bridge. Do not push them all the way in. Make an identical row of four thumb tacks an inch or two below the sound box bridge. Glue the lower third of the lath to the lid of the box. The neck should be exactly between the upper part of the two slits. The thumbtacks should be facing up. Tie the wires to the thumbtacks. Each wire should be tied to a thumbtack on the neck bridge and to the opposite thumbtack on the sound box bridge. The wires should cross snugly through the slits on both bridges. Instead of wire, you can use catgut or taut string. You can even use thin, taut rubber bands. You can also carve the neck to more closely resemble the neck of an actual violin, and use side tuning pegs instead of thumbtacks. Tie wires or strings as tautly as possible, but not so taut that they break.